Welcome to the latest newsletter. In this edition we have a great collection of low mileage cars for sale, an excellent chassis number decoder, some interesting information about warranty protection and a lesson about the Finnish language (I think). I hope you enjoy it. Protecting your new car warranty! Do you have a new Mercedes-Benz that is still under warranty? Have you been told that you must have it dealer serviced so that your warranty is not voided. Or maybe you have seen the posters and other promotional material at Mercedes-Benz dealerships telling you about how bad "non genuine" parts are for your car? If so here is an interesting quote that you should read "Consumers have a freedom to choose whom they deal with and who services their vehicle. Officially, the ACCC states that a new car warranty is protected as long as the parts installed are of "Genuine or appropriate quality". This applies to new or second hand cars" This quote is from a article written by Professor Alan Fells the former Chairman of the Australia Competition and Consumer Commission (ACCC) and was published in the Daily Telegraph on the 11th of February 2003. Every two years a unique experience comes around for lovers of the three pointed star. The Mercedes-Benz clubs of the ACT and NSW are proud to announce that the 2006 national rally will be held in the ACT during Easter 2006. M.B Spares & Service are proud to announce that we are sponsoring the rally as well and providing the rallies website and a breakdown support system for all those attending the rally. The organising committee have been working hard since the 2004 Brisbane rally to put together a very special event and the invitations to attend will be distributed in the next few months via the various Mercedes-Benz Clubs of Australia newsletters. If you click here you will see the very early draft of the website we are preparing for that rally. In time this will be a focal point for all information about the rally along with contact lists and other special information. If you have a look in the left hand margin you will see three notes that have already been published in the ACT and NSW club magazines, we will also soon have each days programmes listed along with other information. This rally will certainly be a great event with attendees from the UK, Germany and New Zealand already booked in. If you are interested, I would suggest that you book in early as there is a limit of 240. Attendance is limited to current members of a Mercedes-Benz Club, if you are not a member of one and would like to join up click here to find you local club. We will have a lot more information on this in the next Newsletter for you. We have two sets of mag wheels that we want to sell at a discounted price. Both are 8.5" X 18" and suit most late model cars. Please ring us for more details if you are interested. Both are pictured below. Price is $1650 a set, the normal retail price is $2100.00 and $1950.00 a set of four. You can check out our full range of mag wheels here. 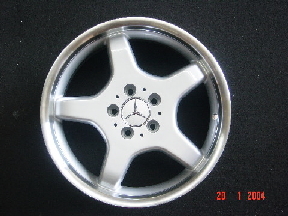 AMG style five spoke wheel. 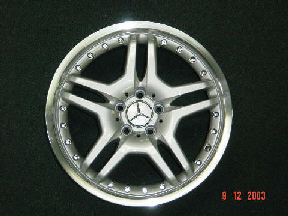 AMG style 10 spoke wheel. The following was sent to me by a customer who recently moved to Finland and was having some trouble with the local language. I have no idea if it is true or a joke, maybe if we have any Finns who read the newsletter they can fill us in. If it is true I will never complain about any of the inadequacies of the English language ever again! SOMEWHERE IN BERLITZ - Finnish is easy. All you do is tape record English and then play it backwards. by an ancient king who commanded the people in his dominion to speak like him upon the penalty of death. The monarch's name shall I give as Toivo I, or Toivo the stutterer. It was Toivo's lingual philosophy that why use one letter when two or three would do. Take the word for cigarette lighter. It is savukkeensytytin, which is the reason why so many Finns carry matches. When the Finns start a word they see how many foreigners they can weed out on the first syllable. Take the Finnish word for "93". The first three letters are "yhd". That eliminates a lot of competition right there. For the full Finnish word for "93" I would advise you fasten your seat belts and put on your crash helmet. Here it goes - "yhdeksänkymmentäkolme". According to Berlitz, that is pronounced simply: "EWHdayksaenKEWMmayntaeKOALmay". Finns have died of old age trying to count to 100.
onto a nearby word as an ending. two little dots over the "a" and that means it is pronounced like an "a" and an "e" slopped together. It also means that you are going to find a lot of dull pencils in Finland. It is the only language I know of where the phonetic spelling is more complicated than the regular spelling. To say "pencil sharpener" in Finnish, for example, you should start with a bottle of good Finnish beer. Take a deep breath, roll back your eyes and say: KEWnae (run the "a" and "e" together now, remember?) nTAYR (stop here and have a sip of beer) roa (then comes a very, very small "i" that fools a lot of people, but, without it the word means "spinach" or something entirely different from "pencil sharpener") ittin (more beer, please). Okay, all together now: "KEWnaenTAYroaittin!" There now, wasn't that easy? Where's the bottle opener? During a recent visit of Finland I never saw a crossword puzzle. The papers weren't large enough to cover both horizontal and vertical I guess. The word for "no" is "aye", which means yes in English, and the word "hei" means hello or goodbye depending on what direction you're going. Now the word for "yes" is simple. It is "kyllä". The trouble is, nobody uses it. They all say "joo" or "yoa" or "yo", which naturally, is not Finnish at all, but is Swedish. To say "yes, yes" they all say "yo-yo". I can't imagine what the finnish word for "yo-yo" is, but it must be dandy-dandy. M.B Spares and Service is looking to employ another Automotive Technician (Mechanic) for our busy workshop. We are quite flexible as to how we employ someone, either an apprentice and a qualified tradesman, full time or part time. What is important however is the attitude of the person we employ. All the staff here at M.B Spares and Service are dedicated lovers of the three pointed star, infact all but one of us drive a Mercedes-Benz! (and we are working on him!) If you love what you do and get enjoyment from it as well as a wage then everyone benefits. So if you or anybody that you know loves Benz's and would like to work with them please let me know. You can e-mail me direct or phone me on 0419 295 458 . 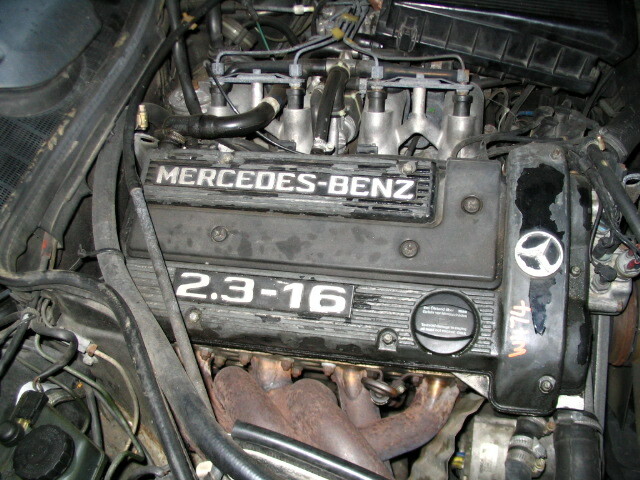 W201 190E 2.3-16 1985 model, yes a rare 190E with the Cossworth tuned twin cam 16 valve engine! A great car but hit hard on the LHF corner. Black with black leather interior. The interior has deep bucket seats front and rear that are in great condition. The body kit is complete with the exception of the guard mould for the LHF guard. Engine and manual 5 speed box are in great condition. Dash is not cracked. 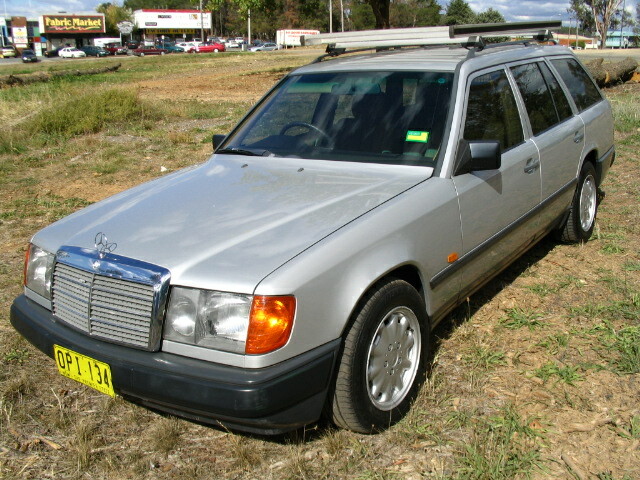 W124 300E 1991 model, also hit LHF black with a grey leather interior, 197000kms with excellent mechanicals. Has alloys, cruise, sunroof, etc. Dash is not cracked. W126 280SE 1982 model, light side swipe on the right hand side. Otherwise a nice neat car. Bone coloured M.B tex interior in good condition. This car is still registered so we have been driving it around until it runs out of fuel! It has a very neat set of 15" factory style alloys with good tyres on them. If you check out WDB12602212000003 you will find what must be the first 280SE ever made. It is a 1979 model that was sold by the factory (possibly to its self) I wonder where this car is now? WDB12602112000001 is the first 280S and whilst it was the model below a 280SE seams to have a much better range of options! Click here to see one mans passion for the W112 chassis. Owning 23 of the same model would surely be a record I would have thought. Bored at the office? Try this link for hours of fun. According to Channel4.com the W116 series is one of the 100 greatest cars. Click here to see why. And finally a couple of interesting ebay finds. Firstly this W111 Binz wagon from the US that is in rather ordinary condition, and a very different W116 here in Australia. And we also have the E280 1994 model with only 117000kms still in stock and have already sold the beautiful 280S 1970model that only had 52000mls. It is always strange how things seem to come in lots! Apart from having a heap of low mileage cars we also have a very wide range of 6cylinder W124 sedans, coupes and wagons at the moment, eight of them to be precise! So if you have been thinking of a W124 sedan now is the time to try and talk us out of one! The 220SE cabriolet has been sold to a local Mercedes-Benz club member so whilst it was sad to see it go (my wife enjoyed driving around in it) it will be great to see it at Benz Club meetings. We are currently working on a 250SE cabriolet and a 300SE Cabriolet that we will be offering for sale in the next few weeks so if you were interested in a W111 or W112 cabriolet please let me know. We have also sold the E230, and traded a 1987 300E on it. the car has since been sold.